On Sunday they jammed the streets celebrating his arrival. But on Friday they were screaming for his blood. What prompted this stunning reversal? Why did this man’s followers and friends demand his death? Crucify! reveals the motive behind the most heinous murder of all time. 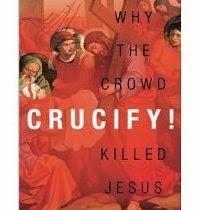 Timothy J. Stoner mines the Gospels to expose Jesus’s secret agenda and uncovers his dangerous and provocative mission. Is there something about this young Rabbi that we have failed to understand or appreciate? Answering these questions raises another—one that is more troubling: If we’d been there, would we have joined with the scandalized crowd crying Crucify? The son of missionary parents, Timothy J. Stoner grew up in Chile and Spain. After graduating from Cedarville University and attending Grand Rapids Theological Seminary, Stoner graduated from Cooley Law School in 1987. Timothy and Patty, his wife of over thirty years, have five children.